Gasthoeve Het Oude Nest is run by family De Kroon. Hostess Betsy De Kroon is a passionate walker and can offer you the most wonderful routes. 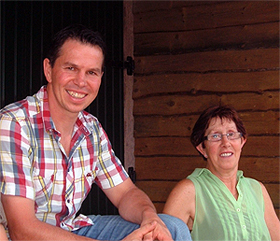 Host, Andrew De Kroon, is not only a cyclist/mountainbiker but a horse trainer as well. You can make a horse and carriage ride through nature reserve Diessens Broek or a guided mountainbike tour. We have an extensive network of specialists for your daily activities like a forester who organizes group excursions in the neighbouring nature reserve and an artist who conducts painting workshops. In case you have alternative plans, like a picnic we will be more than willing to assist you. We are looking for challenges for your experience.